Joseph Mordecai (1851-1940). Mordecai was a painter of portraits, genre scenes and literary subjects. He studied at Heatherleys and the RA Schools and exhibited from 1873-99 at the Royal Academy, Suffolk Street, and elsewhere. Titles included “A Nubian” 1873 and “Day Dreams” 1888. Mordecai painted the last portrait of King Edward VII as well as portraits of many celebrities of a bygone day. He was a double medallist at the Royal Academy and was still actively engaged in his profession after his eightieth birthday. 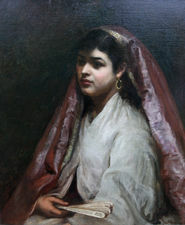 Works are held in the National Portrait Gallery, Leeds and London collections. He died at the age of 89.